If you’ve watched any of the channels in the Disney media empire, including ABC and ESPN, you’ve no doubt experienced the huge amount of promotion they’re doing for the college football championship game. Scheduled for January 11, 2016, the matchup pits Clemson vs. Alabama in a game broadcast on ESPN. 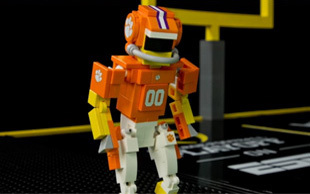 The video features game play clips from the teams interspersed with clips of LEGO Clemson and Alabama players. It’s an exceptionally creative and well-done promotion that you won’t want to miss. Your kids will love it, too. Read more of my LEGO related posts here. What football games are you looking forward to watching? What are your favorite teams?